Kontrol Freek is a company that has a wide range of gaming accessories to make your gaming experience that little bit more special. Gaming is obviously a really fun and rewarding hobby for a lot of us, but that’s not to say that it can be quite frustrating at times! That’s where Kontrol Freek comes in since they offer products that can improve performance as well as reducing fatigue. Some people might think that this gives some players an unfair over others, but if it improves how you play then that’s all that we’re interested in. One thing that makes this manufacturer stand out from the crowd of companies that offer similar products is that the company is full of real gamers that understand the need of their customers. In the past people thought that a mod controller was enough, but these days things have moved on. Nowadays we have the option to make your own modifications to your controller such as thumb extenders that increase the length of your analogue sticks, shields to protect your controller (and make it look much nicer at the same time!) and Kontrol Freek even offers the Rcade Freek which is an arcade inspired analogue stick. All of the items that you can buy from Kontrol Freek can be shipped internationally too which is a bonus since sometimes these types of companies only deal with US customers. They also ship products out using first class mail so you won’t be waiting too long to get your hands on your new gaming gear! But you can now Buy Kontrol Freeks in the UK from us. No matter whether you’re a competitive gamer or just an occasional gamer, it’s definitely worth checking out the range of products from this company. It’s clear that they put a lot of time and effort in to making each and every one of their products which are all patent pending at the moment. 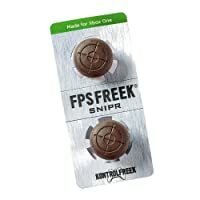 Kontrol Freek aims to reduce force inputs as well as increasing player comfort and they’ve done quite a good job at it. You mightn’t think that there would be a lot of work involved in making a gaming accessory such as an improved analogue stick but there actually is! And this is why they spend a lot of time researching the science involved in controller ergonomics to make sure that you get the results that you’re after. There are around a dozen different Kontrol Freek analogue sticks which might sound a bit crazy at first, but they all are intended for different types of gamers. If you’re not exactly sure which one is best suited towards your needs then we’d recommend checking out this comparison guide which might help you make up your mind. So, if you’re an avid gamer check out their site today!